In the last year or so we moved Blake onto cloth nappies we chose to do this when he was just over 6 months old. We originally had wanted to do this from birth but he was so small for the nappies that we had that he just peed out of them. 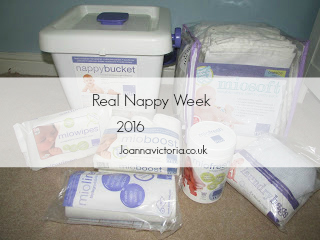 But today in aid of Real Nappy week 2016 I wanted to share with you some of our favorite nappies and products. If you are new to cloth nappies you may want to read some of the posts above before continuing to read this one. Above is a selection of our Bambino Miosolo (AIO) nappies we have 10 of these types of nappies in total in different prints and we love them! Not only are they pretty but they are also so good at keeping everything to contained and simple to use. We use these nappies for when we are out and about and also at night. The below ones are my favorite prints from Bambino Mio. All in one nappies like Bambino Miosolos are pretty simple to use.These nappies have an absorbent inner with an attached waterproof outer layer. This means you don't need a separate wrap. They are a bit slower to dry than other types of nappies however I've never had an issue with this. We also use prefolds and a wrap which are the nappies I use when around the house or if we are just nipping somewhere not too far away like to the nearest park which is 5 mins away from home. I love these as they are good at keeping everything contained the only downside I find with them is that as your child gets more older and are wiggly than you have the issue of the nappy moving everywhere. I personally have started to use these less now although I still will use them but the Miosolos are our go to at the moment. They will definitely come handy in the future though for when we have another child. They are the best for drying the fastest which is another reason we love them so much. Another type of nappy we have recently tried out is a Hybrid nappy. Admittedly we brought this as an impulse buy as Stuart is a huge sonic the hedgehog fan. However I am glad we have purchased it as it works rather well with a Bambino Mio wrap over the top. - Nappy Bucket : We have the Bambino Mio one which has a lockable lid but any will do. 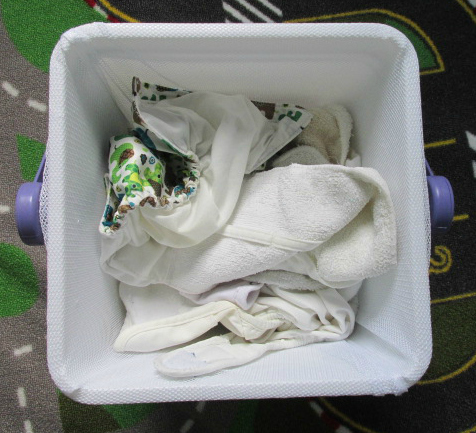 - Laundry Bags: These are what go in bucket so you don't have to touch the nappies when you put them in the wash.
- Liners: We use the Bambino Mio ones which go in the nappy to catch poo. - Miofresh: Not essential but we like to use this nappy cleanser with our usual non bio. - Wet Bag: To put your clean and dirty nappies in when going out and about. We have one which has two compartments to keep clean and dirty ones separate. - Vest extenders: A recent purchase for us which we wish we had brought sooner. - Cloth wipes: We use cloth wipes as well which are great at cleaning bums and we make our own nappy wipe solution so we know what is going on Blake's bum. I hope this post and/or any of my other cloth nappy posts have been helpful to you. I'd love to know your thoughts on cloth nappies. Do you use them? have you used them? If not why you have chosen not to use them? Blake's not walking yet but am hoping they will be ok for us. My mother had me in terry towelling squares with plastic pants. How the world changes! I applaud you for using them - landfill is full of disposable nappies. I would have never considered really nappies but you have made it seem easier than I thought. And they are really cute! It's really not as bad as most people think. Interested to hear that you only started at six months. I am considering moving onto them now and my daughter is nearly four months. She is really tiny for her age and I've no clue where to start! We wanted to try sooner but with the nappies web had Blake was too small for them we could have purchased smaller ones but just chose to wait til they fitted him. Awww these are too cute! My nephew could use some of them! Haha! I love the designs and patterns on cloth nappies - and that Sonic one is so cool! I had good intentions before Marianna was born but once she actually arrived my resolve crumbled. If we did it all again I don't think I'd be as squeamish though! They are so beautiful and colourful. And environmental. Well done for going down that path. I didn't really think about using reusable nappies with our son but I can see the appeal. And the designs are so cute! The Sonic The Hedgehog hybrid is so cool. I know a lot of people who use cloth nappies and they love them! They have some cute designs, I didn't use anything like this with mine. 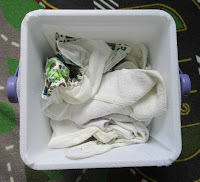 I used washable nappies with my 1st and he was ready to potty train at 18-20 months! I used them a bit with my 2nd, but I had so much in my hands with my 3rd and 4th that I don't think they even went near a washable nappy, he he! I never used cloth nappies with either of my two. I always went for disposable. Fair play to using them. I'd say if only cloth nappies were around and no disposable ones I would get my child potty training asap. I don't like the idea of washing them all the time. I have the washing machine on pretty much every day. 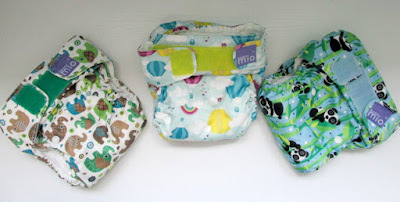 Cloth nappies are just adorable, I love all the designs they're available in. That sonic one is too cool. I'd love to use cloth nappies with our new baby. These nappies are so cool and different it makes "pooping" fan haha. I have many friends who use them on their babies and love them . Awww these are so cute! Love bright colours! But I am not sure if I use them myself. It looks quite a lot of work.